The Sidi community lives mostly in Gujarat (in western India), with smaller populations settled in the neighboring state of Maharashtra and the southern states of Karnataka and Andhra Pradesh. There is no accurate census on the number of Sidis in India. According to various publications, there are no more than 20,000 in any one state. Although most Sidis live in villages, many are urban dwellers residing in towns and cities. Some also live in tribal surroundings and villages. Descendants of African slaves and seamen, the ancestors of the Sidis came to India through sea trade with East Africa and the Gulf around the 12th century. 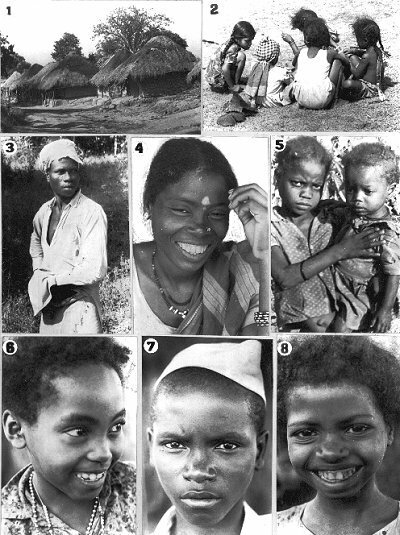 They came from different areas such as Ethiopia, Somalia, Sudan and later Zanzibar. The Sidis of Gujarat are Muslims with a strong Sufi tradition. They have to some extent assimilated into the local culture through their dress, food and language, though their dark skin and African features are distinctive. Some have even married outside of their community. But, by and large, they remain marginalized, leading a life of relative obscurity and poverty. In some districts, the government has accorded them the Scheduled Tribe status. Their history lost in time, the Sidis' only link to their past is their devotional music and dance dedicated to Gori Pir, a Sufi saint from Africa. Known as Hazrat Mubarak Nobi, he is said to have come from Nubia to India from Africa via Mecca, and stopped in Basra (in Iraq) to study with Rifai Sufis. He has shrines throughout Gujarat, in the places stopped at before settling in Bharuch district. Here he set up an agate workshop and became part of the Indian Ocean trade, especially in tasbihs (Islamic prayer beads) for hajis (pilgrims). The fascinating culture and history of the Sidis was unknown to the world beyond their small communities spread across India. Over the past seven-eight years, though, Dr Amy Catlin-Jairazbhoy's intervention has changed that. A visiting Associate Professor and Research Scholar in the Department of Ethnomusicology at University of California, Los Angeles, Catlin-Jairazbhoy has explored the cultural and historical significance of the Sidis, not only in Indian society but also as part of the larger African Diaspora. Her work has been much inspired by the groundbreaking anthropological work of Dr Helen Basu - whose book 'Sidi Sklaven, Habshi Fakiren' (Sidi Slaves, Habshi Faqirs) is considered a classic on the Sidi community; husband Nazir Jairazbhoy's collaboration; Professor of Women's Studies at University of California at Irvine and the advice of Beheroze Shroff, who guided her initial contacts with Sidis in Mumbai and Gujarat. Catlin-Jairazbhoy became interested in the Sidi community in the 1970s, when she came from the US to Chennai, Tamil Nadu to do her dissertation in Carnatic music. She had always been interested in spirituality and music. And since she grew up during the era of the American Civil Rights movement, Catlin-Jairazbhoy had become well acquainted with the African-American culture and the teachings of Mahatma Gandhi and India. Twenty years later, she and her husband ethnomusicologist Nazir Jairazbhoy made a short film on the music of Kutch. This was when they came into contact with the Sidis of Gujarat. The film generated much interest in the US, but Catlin-Jairazbhoy wanted to do more for the Sidis. She approached the erstwhile royal family of Rajpipla to put up a conference on the Sidis in Gujarat. The three-day conference brought much-needed attention to the community, with several scholars in attendance and active media participation. The Sidis welcomed her efforts and, as she points out, "in fact sought help to find an opportunity to tour outside India". In 1991, Catlin-Jairazbhoy and her husband founded the Apsara Media for Intercultural Education based in Van Nuys, California USA, to create a platform for in-depth documentary research from South Asia and Southeast Asia, including research on the Sidis. A small but important step had been taken towards changing the perception of the Sidis from that of an outsider community to a people who had much to offer through their rich musical tradition. In September 2002, Catlin-Jairazbhoy put together a group of Sidi performers from Gujarat for their first concert and lecture tour outside India. It seemed destined; Catlin-Jairazbhoy found "everything worked like magic". The success of the show was followed by more international performances by the Sidis, including a historic tour to East Africa, the land of their ancestors. They performed to excited audiences in Mombasa and in Nairobi followed by 'jamming sessions' with local musicians in a sort of cultural exchange during a two-day stay at Zanzibar. In 2002, Catlin-Jairazbhoy published the CD 'Sidi Sufis: African Indian Mystics of Gujarat' and a year later 'From Africa to India: Sidi Music in the Indian Ocean Diaspora, the feature-length documentary, which pieces together the history, religion and sacred music of the Sidis over the centuries, making it an important part of understanding the African Diaspora in the context of the Indian subcontinent. The following year, she co-edited 'Sidis and Scholars: Essays on African Indians' containing essays by European, American and Indian scholars who have worked with the Sidis in Gujarat, Karnataka, and Mumbai. There is also the CD compilation, which comprises field recordings from Sidi shrines (dedicated to Gori Pir) throughout Gujarat, recorded between 1999 and 2002. The Sidis have traditionally been wandering faqirs (mendicants) making their livelihood from alms given for their musical performances. These performances include a mesmerizing array of instruments - such as coconut rattles and armpit-held drums - which hark back to their African roots. However, the most distinctive of these instruments is the footed drum, with its pegged head and three or four 'feet'. As Catlin-Jairazbhoy points out, "Similar types of pegged drumheads and footed drums are widespread on the East Coast of Africa, while they are otherwise unknown in India." The CD was made in collaboration with the Sidi community and Abdul Hamid Sidi, one of the lead dancers in Sidi Goma the touring group, whom the Jairazbhoys have trained in research and documentation. The proceeds from the recordings were put to the benefit of Sidi education projects in Gujarat. In February 2003, she held a workshop to preserve Sidi culture. The 'Sidi Malunga Project' brought together some Sidi elders to teach the basic techniques of constructing and performing the traditional Malunga - an African musical bow used by the Sidis in their songs. There is no doubt we live in a culture that is exceedingly becoming absorbed by the events of the present. But Catlin-Jairazbhoy's work emphasizes the importance of cultural and historical legacy in discovering our own place in contemporary society. Thus, as the Sidis sing and dance, and tour the world, they celebrate their present and honor their past with the hope that their new local and transnational relationships will create a more promising future.